Wow, St Patrick’s Day is here, so I thought what better way to celebrate, than some modern twists on Irish classics. Irish stew recipes vary all over the country, it was originally a peasant’s dish that used whatever ingredients were available on the day, hence the variations. 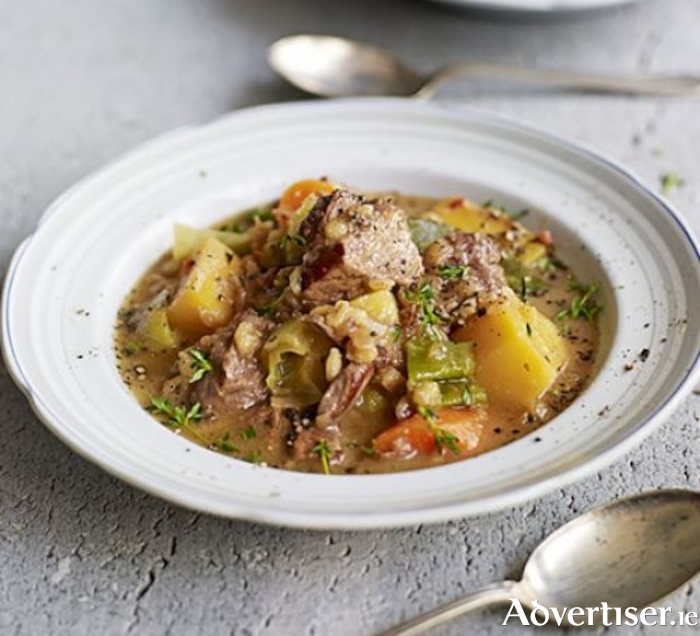 There is something very comforting about Irish stew, very homely, so if you used different ingredients in your home, feel free to add them to this recipe. My version here is loosely based on my mother’s version that I enjoyed as a child in Donegal, so I hope that you will enjoy it too. This will be enough to feed four people. Firstly, remove any excess fat you might find on the meat. Put the meat into a saucepan, cover with cold water, bring to the boil and let it simmer for about an hour and a half. Skim off any impurities that lie on the top of the water. Add all the rest of the ingredients apart from the potatoes and bring to the boil again, cook for about 20 minutes and then add the potatoes. The potatoes will thicken the stew slowly, and to get the right consistency I turn off the stew when the potatoes are just cooked and break when touched with a fork. That is it, serve with crusty brown bread and a glass of the black stuff to celebrate St. Patrick’s Day in style. Leo is visiting Donald in Washington tomorrow to celebrate St Patrick’s Day, so here is a beautiful cheesecake recipe using Oreo biscuits, the bestselling biscuits in the world, as a nod to our American cousins. This can be made the night before and is so easy to serve after the stew. This recipe has been adapted by me, from the Kraft website. First I take the cream out of half the packet of biscuits and add it to the cream cheese. Then I crush these biscuits and mix with the melted butter. Press this down firmly on to the bottom of a nine-inch cake tin to form a base for the cheesecake. Put it in the fridge to set while you prepare the cheese mixture. Coarsely chop the rest of the biscuits and set aside. For these biscuits chop the entire cookie. Beat the cream cheese, sugar, and vanilla in large bowl with electric mixer on medium speed until well blended. Gently stir in whipped cream and chopped cookies. Spoon this mixture over the base and cover with clingfilm. Refrigerate for at least six hours or overnight. I usually make this the night before to ensure that it sets perfectly. I know some chefs use gelatine to help it set, but this way is a lot easier and gives a lighter texture. To serve, I would sometimes drizzle each slice with melted chocolate, but to be honest it is lovely as it is.